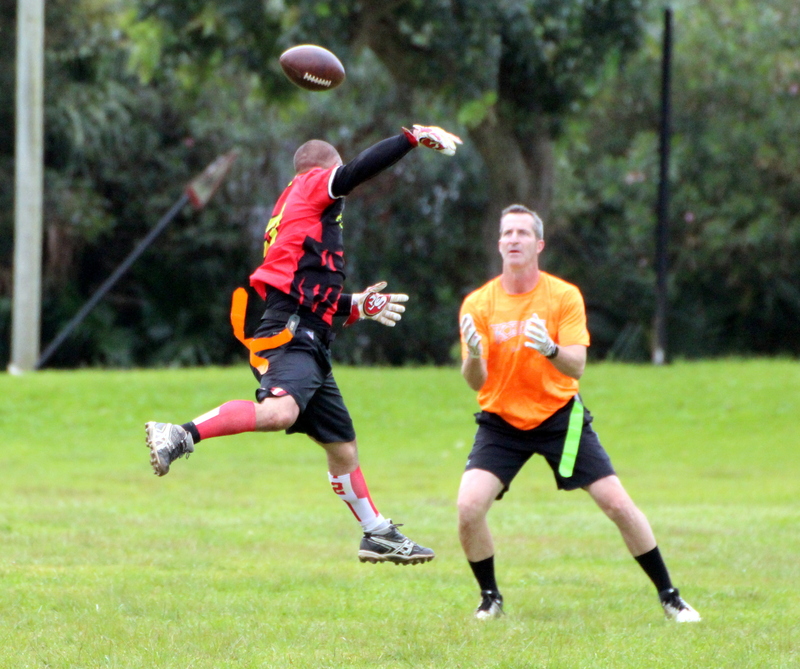 The Bermuda Flag Football League season resumed with a double header at the TN Tatem School Field. In the opener the Black Shark$ defeated the Punisher 32 – 15, Zakee Govia led the Black Shark$ with 2 Touchdowns, 2 Sacks, 1 Interception and 1 Defensive Touchdown, while the Punisher were led by Jared Jimenez with 2 passing Touchdowns and an Interception. In the second game the Killa Squad defeated the X-Patriots 33 – 0, Stevey Brown-Darrell had 2 Touchdowns and 2 Interceptions, in leading the Killa Squad to victory, while Matt Kielo had 4 Sacks for the X-Patriots. 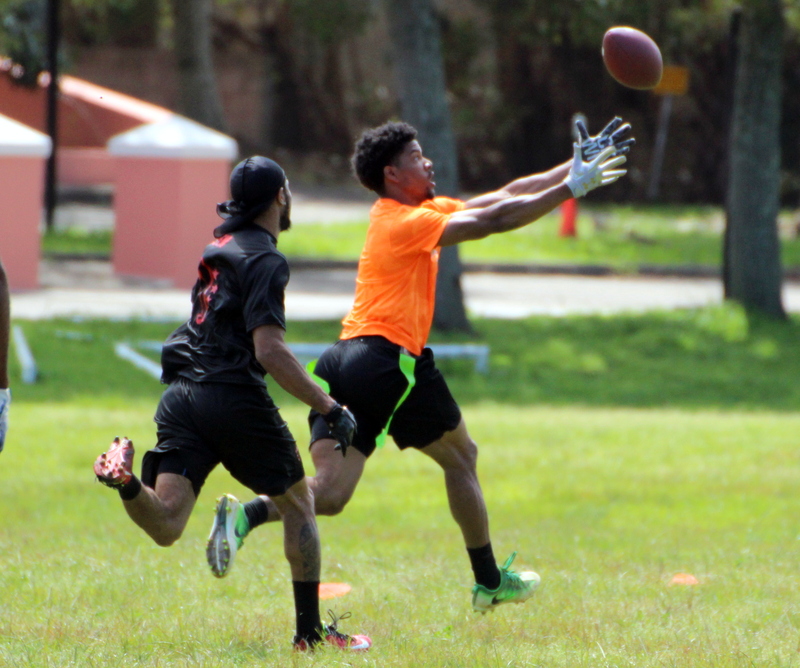 The Bermuda Flag Football League Spring Season continued on the T.N. Tatem Middle School Field with 68 points put on the board in a double header. The Beer-muda Misfits were led to victory by Jamie Baum who had a Touchdown and 2 Sacks, while Kierra Smith had an Interception for the X-Patriots. The second game saw the Black Shark$ defeat the Killa Squad 26 – 18. Ryan Rabain led the Black Shark$ with 3 passing Touchdowns and 1 Interception, while sprinter Kyle Webb was the player of the game for Killa Squad with 2 Touchdown receptions. 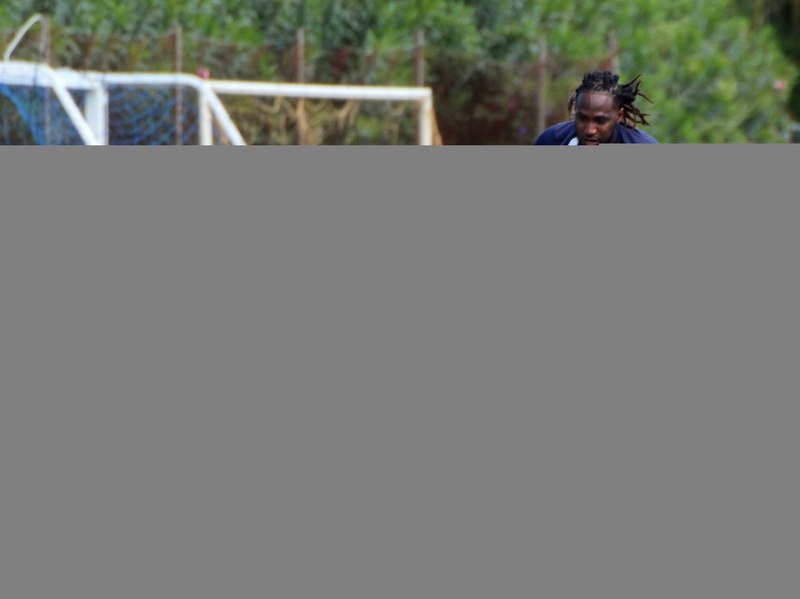 The Bermuda Flag Football League Spring Season continued on the T.N. Tatem Middle School Field with 89 points put on the board in a double header. The opening game was decided by just 5 points as the Punisher’s defeated the Killa Squad 18 – 13, Chris Crumpler led the Punisher’s to victory with 3 passing Touch Downs, while Quinn Simmons led the Killa Squad with 1 Touch Down and 2 Interceptions. The second game saw the Black Shark$ defeated the Beer-muda Misfits 46 – 12. Zakee Govia scored 3 Touch Downs, to go along with 1 Interception and 1 Defensive Touch Down to lead the Black Shark$ to victory, while Steve Hilton score 2 Touch Downs for the Beer-muda Misfits. 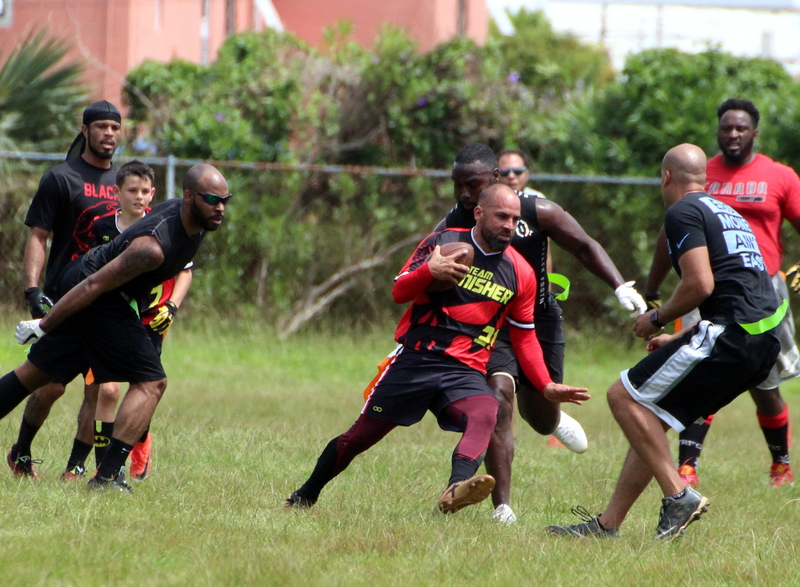 The Bermuda Flag Football League Spring Season continued on the T.N. Tatem Middle School Field with 104 points put on the board in a double header. In the opener the Black Shark$ edged the X-Patriots 20 – 19, Ryan Rabain would lead the Black Shark$ with 3 Touchdowns and 2 Interceptions, while the X-Patriots were led by Shane Granville who had 3 Touchdowns. The second match saw the Punisher defeat the Beer-muda Misfits 52 – 13, Chris Crumpler led the Punisher’s with 8 Touchdowns, while Steve Hilton scored 2 Touchdowns for the Beer-muda Misfits. 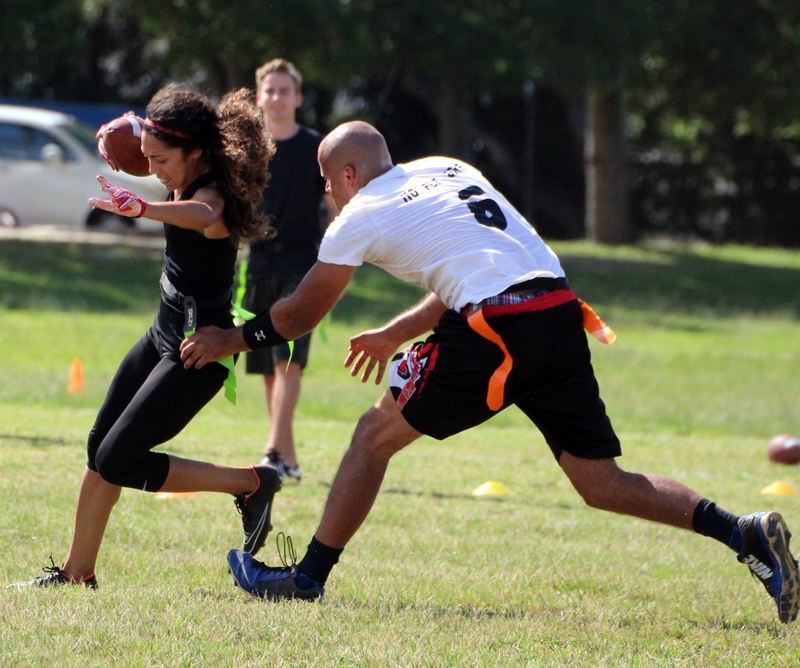 The Bermuda Flag Football League Spring Season got underway on the T.N. Tatem Middle School Field with 77 points put on the board in a double header. The Black Shark$ defeated the Punisher 33 – 12, the Black Shark$ were led to victory by Ryan Rabain who scored 5 Touch Downs. The second game of the day saw the X-Patriots defeat the Killa Squad 25 – 7, with Jahan Cendenio leading the X-Patriots scoring 1 Touch Down and 3 sacks.